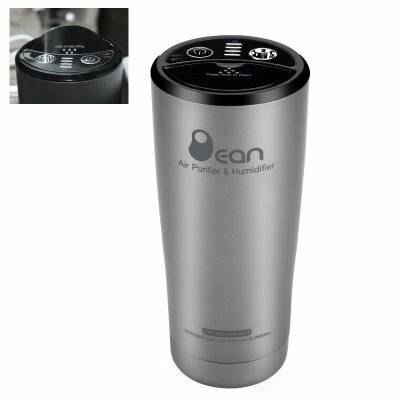 Successfully Added Bean 201A(H) Portable Air Purifier - Purification, Humidification, Air Quality Testing, 5V, 2A to your Shopping Cart. Detects and removes remove harmful elements, bacteria, PM2.5, toxic gases, unpleasant odors and other substances. Make sure the air in your home, office, car or even hotel room is safe to breathe for you and your loved ones with the Bean 201A(H) Portable Air Purifier that will purify, humidify and inform you about the air in your home. Air quality is an increasingly significant issue. Long-term exposure to harmful particles can have adverse effects on one’s health:irritation of the airways, coughing or difficulty breathing are all symptoms of breathing polluted air. With lots of pollutants around, keeping the air around you clean and safe is of utmost importance. Luckily, it’s now quite easy to do. An air purifier is an efficient purification tool that helps remove harmful elements, bacteria, PM2.5, toxic gases, unpleasant odors and other substances. It can also make sure the air stays humid, even after purification and is good for your skin. If you don’t have enough space for a full-sized air purifier or simply want to keep things simple, the portable air purifier is the ideal solution. It comes with all the power of a larger machine, yet won't require too much space and would be perfect for a smaller apartment, dorm room, office, desk or even traveling. If you are often on the move and worry about air conditions in the country you are visiting, a portable air purifier can simply sit in your hotel room and ensure you have clean air to breathe. With powerful air purifying functionality and the size no larger than a cup, the portable air purifier is an easy and effective solution for keeping the air around your clean and healthy. The Bean 201A(H) Portable Air Purifier comes with a 12 months warranty, brought to you by the leader in electronic devices as well as wholesale air purifiers..